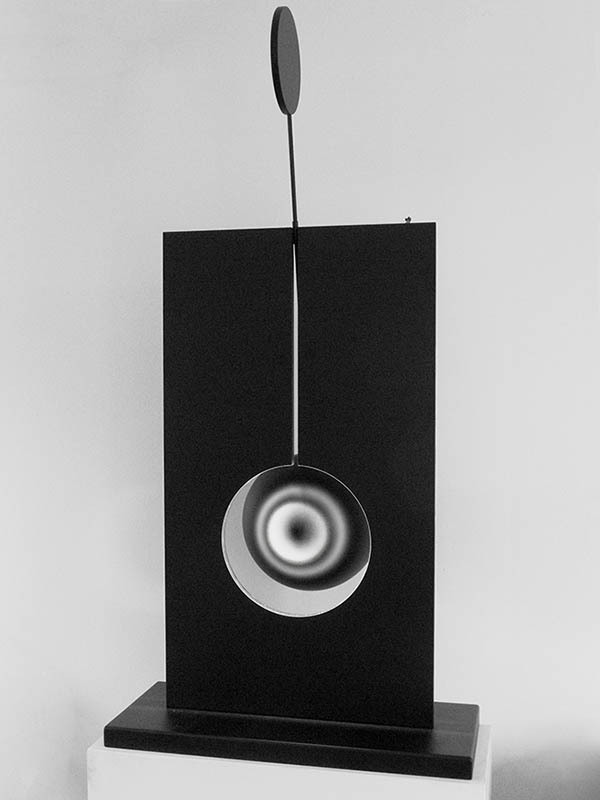 Trained in photography, Damien Bénéteau transposes the process of capturing light into sculpture. In his works the juxtaposition of objects, movement and light serves to produce two types of sculpture, molding the ﬁeld of vision as well as his materials. Drawing on minimal sculpture, Op art and neo-opticalism, he borrows from these movements: geometric aesthetics, sobriety and the appearance of simplicity. 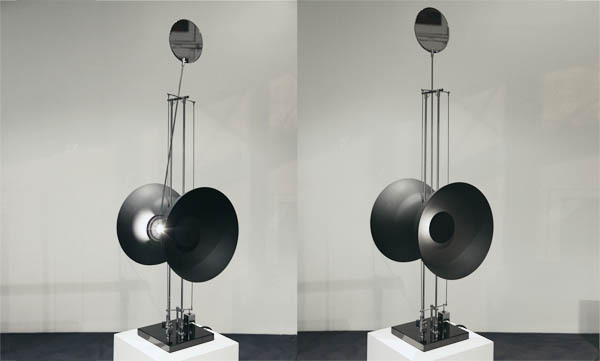 Thus, his monochromatic mobiles display deliberate neutrality and a certain mechanical coolness, compensated by the strange depth of the surface and the structures’ elegance. 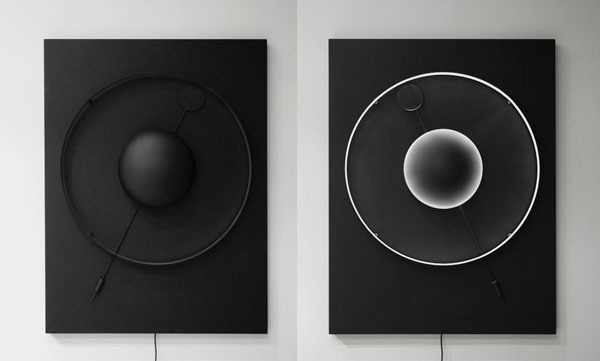 Their swinging or oscillating, cyclical movement combines with internal LED assemblies to transform these sculptures, which are hermetically black, into veritable visual events in inﬁnity of hues. Seeking visual effects rather than illusions, Damien Bénéteau employs his own sculptural vocabulary, made of gaps, shadows, ellipses and halos, metamorphosing the way the spectator looks at his works. Sculpting light enables Damien Bénéteau to reveal hidden corners within spaces, to invert contrasts to bring new forms to life, add tints and colour gradients, or redeﬁne reliefs and depths. 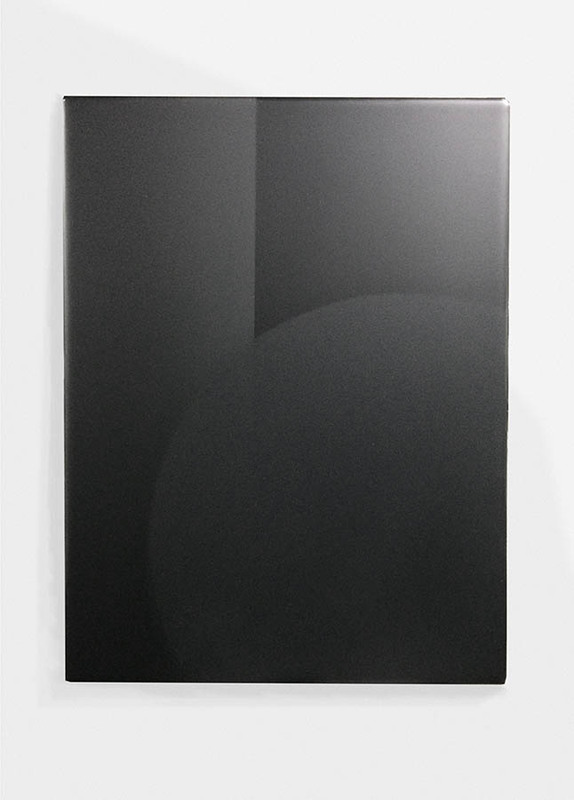 The dark, matt black surface contrasts with the dense light of the white LEDs, producing retinal persistence and aura effects. Damien Bénéteau thereby performs the double operation, both revealing and ﬁxing these intangible impressions which largely determine an object's visibility. The hypnotic repetition and continuous play of 'revealed then hidden' lull spectators into a state of contemplation, leading them to meditate on the notion of time. By mimicking such magical objects as celestial bodies, pendulums and metronomes, these mobiles in perpetual motion subtly organise a passage from the historical present, suspended during the encounter with the work, to the present of astronomical time, evocative of the macrocosm. Damien Bénéteau’s thought-provoking sculptures softly point towards the inexorable passage of time and an awareness of its eternal return. Moreover, the sculptor boldly plays on the double meaning of 'gravity', apposing the law of physics with its affective interpretation, the momentum of nature with the solemnity which it imposes. 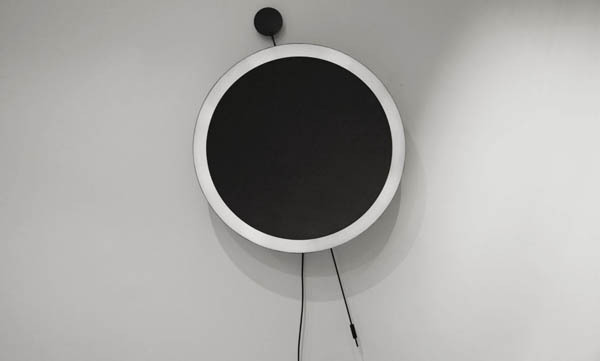 The installation Cosmogonie is displayed as an interior rotunda, borrowing its shapes from horological mechanisms as well as from the planetary mobile. As a metaphoric statement on the genesis of the world and the cycle of time, it presents strong formal convergences with minimalistic sculpture. Here, Damien Bénéteau reduces a representation of cosmos to the human scale and to its minimal signifier, materializing in situ his poetic vision of the Origin. 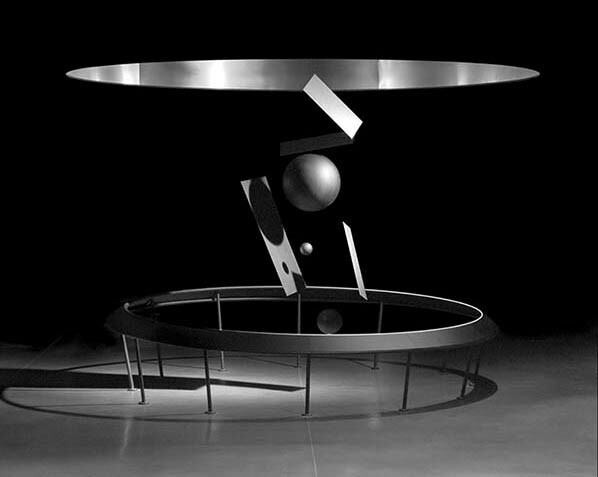 The static suspended layout of the central sculpture combines in an ethereal composition three astral spheres and several thin hanging plates, slightly curved and tilted, in the manner of a deconstructed planetarium, crossed over by mysterious metallic totems. The sculpture is surmounted by a ring, in which a needle – its tip equipped with a lamp – carries out a minute long revolution. The structure’s cold geometry, the depth of the matt black and the material’s shine shape a solemn, sober and dynamic composition whose volumes are constantly redrawn by the light. Induced by its reflection on the material’s surface, the play with texture variations is cadenced by the hypnotic regularity of the rotating arm, offering the opportunity of a serene and dreamy contemplation. Responding to this general principal of roundness, Cosmogonie is surrounded by an inclined plane that allows students to stop there for a moment. Located in a passage way, a high school hallway, this meeting point invites passers-by to pause, to retire from the temporality of a school day in order to embrace, for one moment, the rhythm of an infinite loop, that of perpetual movement. Cosmogonie "2016" from Damien Beneteau on Vimeo. 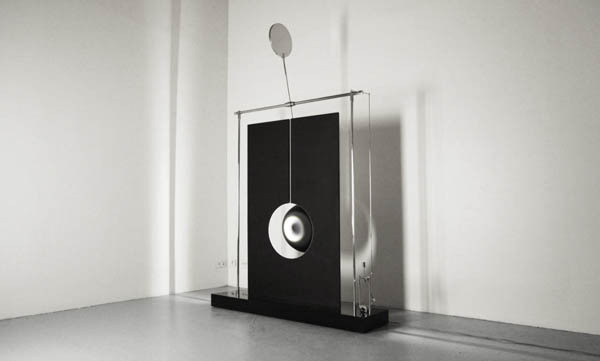 The Variations series is based on the movement of a pendulum, whose rhythm is determined by the speciﬁc weight of each mass. 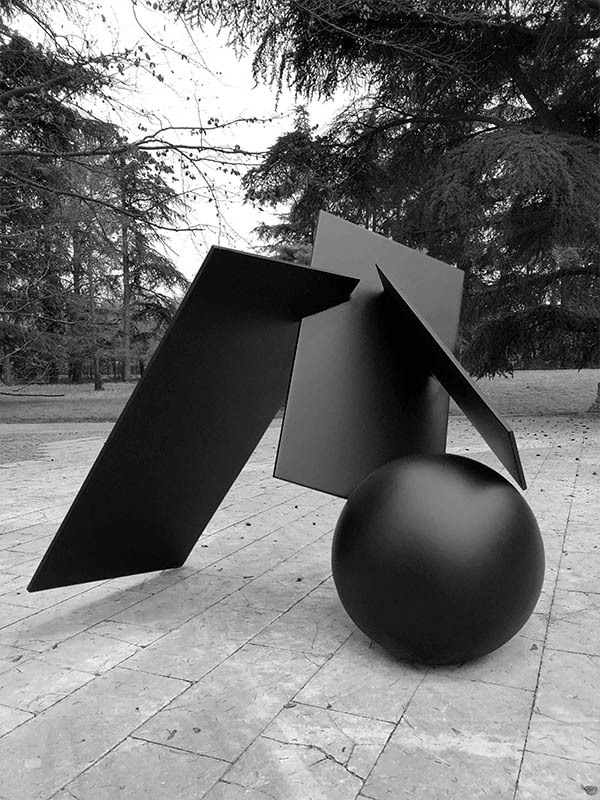 An interdisciplinary theme, shared among mathematics, astronomy, biology and music, variation implies a gap, a way of being different which an animated sculpture can adopt to highlight its singularity. 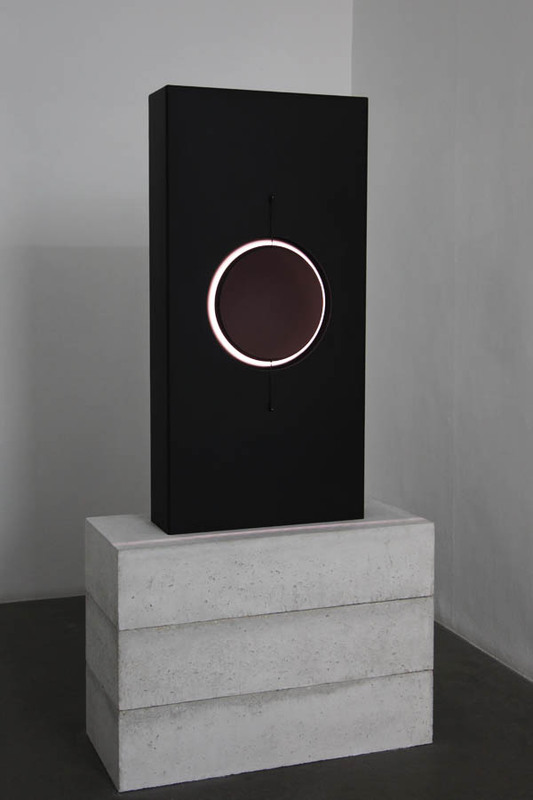 Furtively evoking the contours of a loudspeaker, a musical note or a metronome, these sculptures punctuate the music of time which ticks on and the echo of the beat of life. Spatial variations "2012" from Damien Beneteau on Vimeo. Length Variations "2013" from Damien Beneteau on Vimeo. Parabolic Variations "2013" from Damien Beneteau on Vimeo. Circular Variations "2014" from Damien Beneteau on Vimeo. shaped, which he places almost in the centre of his parallelepipeds. 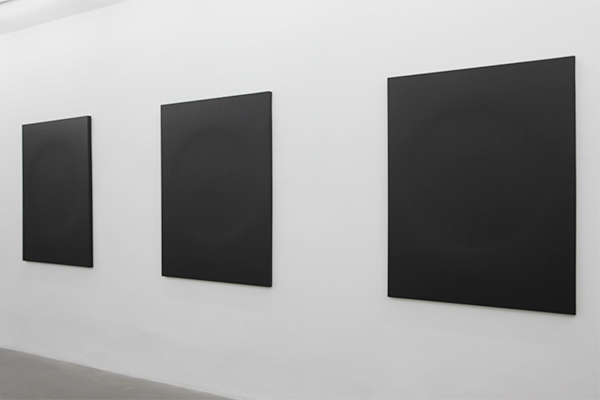 The transformations produced by light, pushed to the limit until it is no longer possible to locate the actual source of the light, are accompanied by a subtle sound, ampliﬁed by resonance, conferring a strong presence on the works. The intriguing, massive bodies of each of these black steles are reminiscent of the mysterious totem in Kubrik's 2001: A Space Odyssey, and oscillate between seductive power and troubling distancing. Sphérolite "2014" from Damien Beneteau on Vimeo. With his Reliefs, Damien Bénéteau tests a radical, formal device, returning to the roots of his approach. 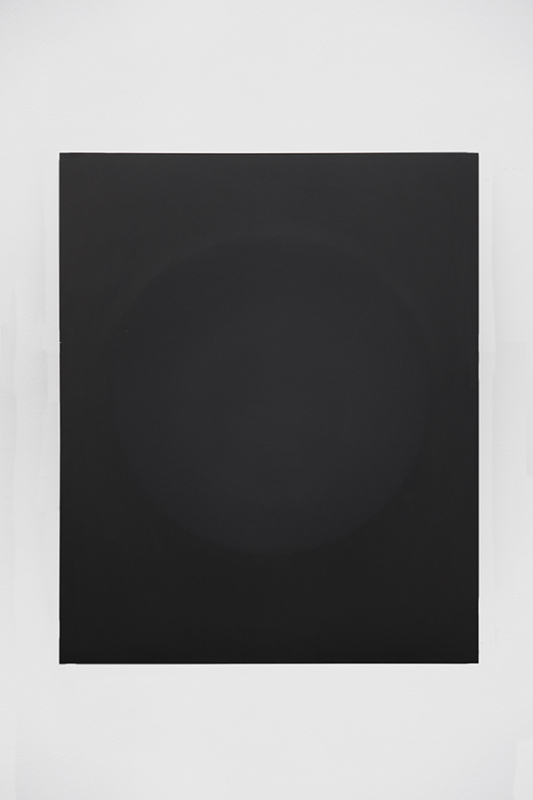 His black monochromes on sheet metal bring geometrical creates a dialogue among gradations of light, to confer a quality of plasticity in movement on his material. 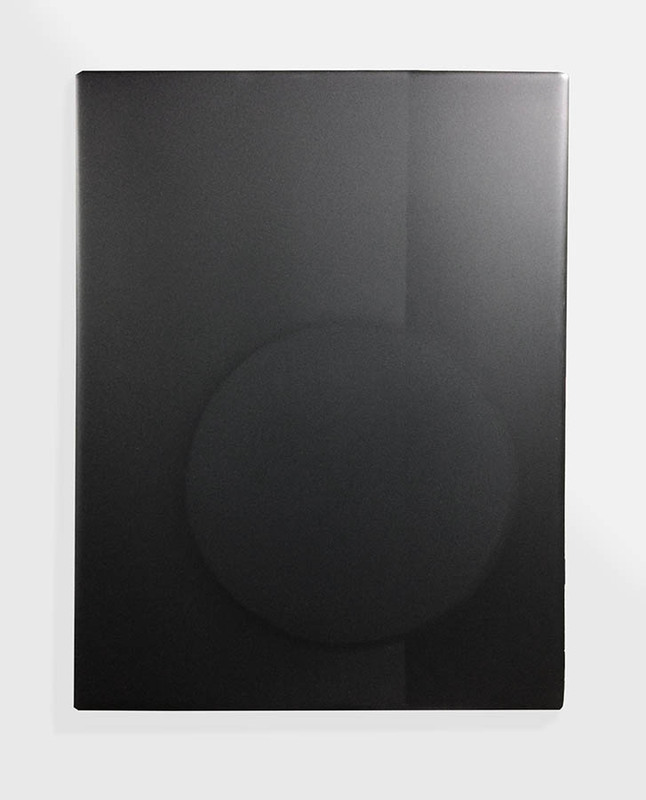 In the centre of each Relief is a barely visible disc, slightly concave or conversely convex and hardly distinguishable from the plane surface, establishing a minimal difference of perception at the heart of the material. 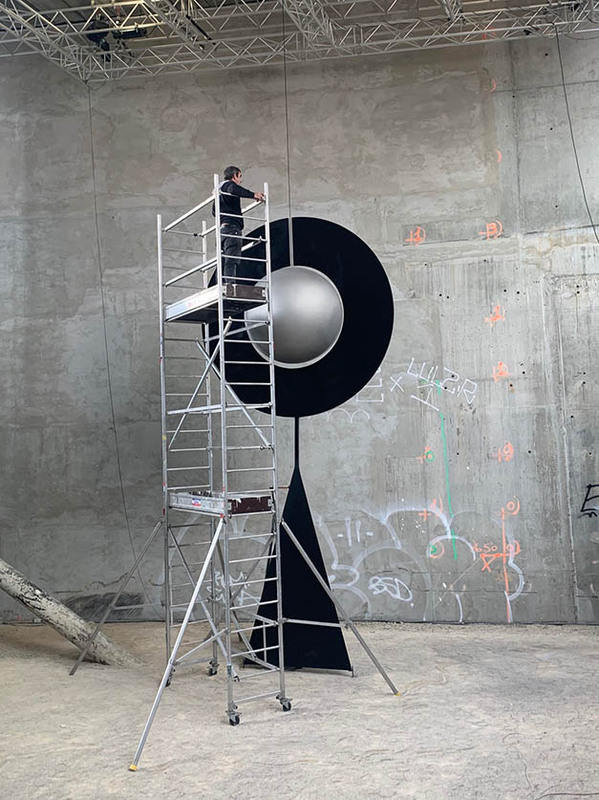 Whereas in his earlier works the optical transformations were brought about by luminous devices and mechanics within the sculpture, Damien Bénéteau is relying here on the spectator's walking around the work to activate a dynamic view which reveals miniscule variations. By working the 'inframince', that is, barely perceptible esthetic events, these works set in motion the imagination and the sensoriality of the spectators who ﬁnd themselves immersed in the sculptural and pictorial crevices forming before their eyes. Damien Bénéteau was born in l'Hay les Roses in 1971. He lives and works in Ivry sur Seine. In 1993, after obtaining a BTS (vocational training certiﬁcate) in photography, he joined the press agency MPA (specialising in actors' portraits), while also compiling photographic reports on a number of subjects for Yann Kersalé, including the Pont de Normandie and the "Parabola" in Cahors. He photographed the projects of architectural ﬁrms: Architecture Studio, Gallois Dudzik Associés and B.A.D. In 1998, he founded a collective of photographers called "Les Cyclopes" whose work focuses on fashion. Their images have not only been published in France, in Libération, Le Monde, L'Ofﬁciel, Art Press and Beaux Arts, but also abroad, in The Sunday Times Style (UK), ID magazine (UK), W (USA) and Visionaire (USA). They participated in several collective exhibitions, including "La Beauté en Avignon" in 2000, "Le Corps Mutant" in the Enrico Navara Gallery, and an exhibition at the FRAC, the regional contemporary art collection of the French Aquitaine Region in 2001. In 2005 they organized their ﬁrst solo exhibition entitled "C'est des sorcières..." followed in 2008 by "Justiﬁé par le haut". Damien Bénéteau’s career as a plastic artist started in 2010, when he chose to transpose the process of capturing light in the sculptural genre. The result is a sober and minimalistic plastic work which combines light sculpture, play with textures on the surface of volumes and, frequently, a mechanical and luminary animation which adds dynamism to the perception. Since 2015, Damien Bénéteau collaborates with the Morrison Gallery, USA, the MAD Gallery "Geneva, Dubai, Taipei" and galerie Mathias Coullaud, France.